CSU San Marcos has a bomb-sniffing dog — a 4-year-old German Shepherd named Armor. He can detect 20 odors — more than the federal requirement for a certified K-9. Armor also helps protect VIPs. In September, he was assigned to a small team that provided support for the CNN Republican presidential debate at the Ronald Reagan Library. As one of three explosives detection canines in the California State University system — and the only one in North County — he needs protection as well. Armor, guided by CSU police Officer David Angulo, will get a bullet- and stab-protective vest donated by Vested Interest in K9s Inc., the school said Tuesday. 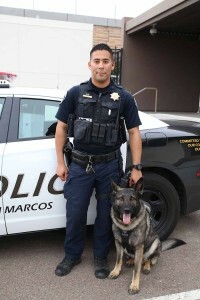 “Because of the high risk of danger to the public, campus community and officers, when a bomb or other device it suspected, the use of a trained explosive detection canine such as Armor is warranted,” Angulo said. Originally from Germany, Armor arrived in America for training less than a year ago. 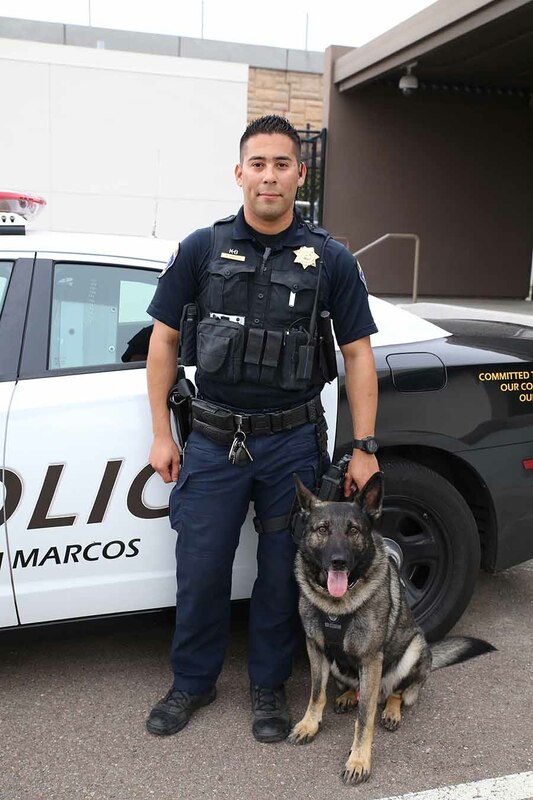 Angulo and Armor spent countless hours at the Inglis Police Dog Academy in Santa Paula before working their first assignment together at university commencement last May. 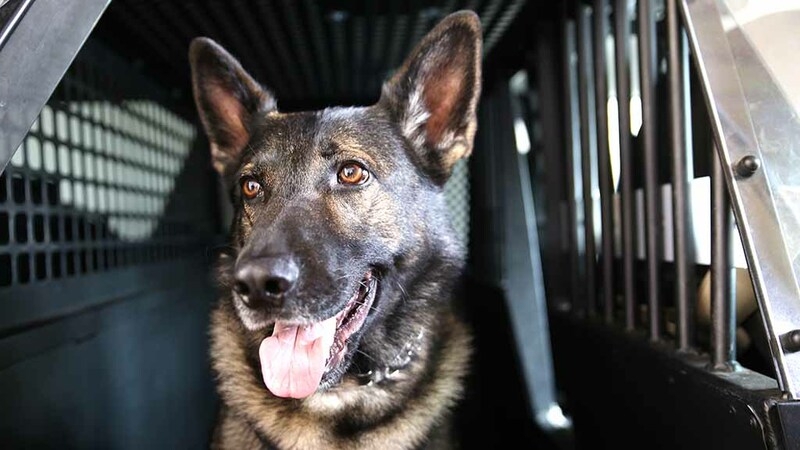 Vested Interest, dedicated to the safety of law enforcement canines, began a Groupon Grassroots campaign to fund ballistic vests and raised more than $335,000 through tax-deductible donations. Each vest has a value of $1,700 to $2,300. Angulo and Armor conduct campus searches, but their duties extend beyond CSUSM. They are frequently on call for external requests from the city of San Marcos and surrounding communities. In January 2014, K-9 Rocco of the Pittsburgh Police Department died two days after being stabbed while protecting his handler from a struggle with a fugitive armed with a knife. All vests will be embroidered in his honor with the sentiment, “In Memory of K-9 Rocco, Pittsburgh Bureau of Police,” CSU said.